European Union foreign minister warns White House of 'consequences' and 'serious repercussions' if Trump recognizes Israeli capital. The European Union chastised President Donald Trump over his hesitation to renew a waiver permitting the US embassy to remain in Tel Aviv, and warned him of “serious repercussions” if the US recognizes Israel’s capital city, Jerusalem. The EU’s top diplomat, Federica Mogherini, issued a statement Tuesday warning the White House of “consequences” if it either relocated its embassy in Israel from Tel Aviv to Jerusalem, or even formally declared its recognition of the city as Israel’s capital. 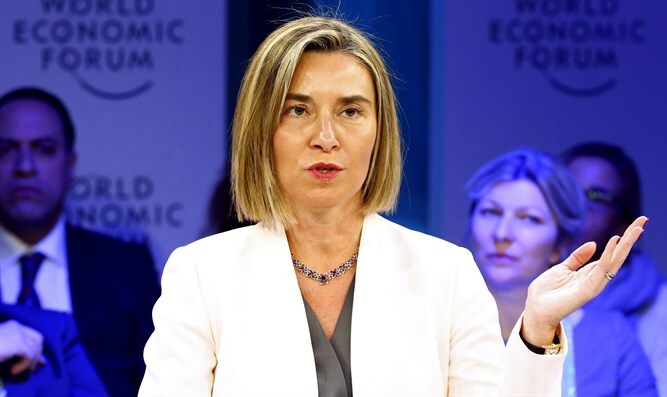 "Since early this year, the European Union was clear in its expectation that there can be reflection on the consequences that any decision or unilateral action affecting Jerusalem's status could have," Mogherini's office said in a statement. "The focus should therefore remain on the efforts to restart the peace process and avoiding any action that would undermine such efforts." While the Israeli parliament, Supreme Court, and Prime Minister's Office are all located in Jerusalem, Mogherini argued that world powers must avoid recognizing the city as Israel's capital until a final status agreement between Israel and the Palestinian Authority is reached. "A way must be found through negotiations to resolve the status of Jerusalem as the future capital of both states, so that the aspiration of both parties can be fulfilled," Mogherini said in Brussels after talks with US Secretary of State Rex Tillerson. Under the 1995 Jerusalem Embassy Act, the US embassy in Israel must be moved to Israel’s capital city, Jerusalem. The act does provide for a security waiver, however, allowing the president to delay implementation of the law for six months at a time if security conditions do not, in the president’s view, permit the move. Every president from Clinton to Trump has used the waiver to push off the embassy move. While then-candidate Trump vowed in 2016 to move the embassy, on June 1st, 2017, Trump signed a six-month waiver allowing the embassy to remain in Tel Aviv until December 1st. Trump’s apparent interest in changing US policy vis-à-vis Jerusalem, by either relocating the US embassy or openly recognizing the city as Israel’s capital, has drawn criticism from European allies and Muslim states. On Monday, French President Emmanuel Macron expressed “concern” during a phone call with Trump over the possible changes in US policy, while Turkey warned Tuesday it could sever ties with Israel in retaliation for US recognition of the Israeli capital.